The MX Scratchiness Problem - Kill It with Fire? It got me thinking of a technique I recently heard about for finishing cut acrylic parts, called flame polishing. It looks like just the littlest bit of heat produces impressive results. Now, this is with acrylic, and I believe Cherry MX stems are POM. I don't know much about either material, especially in terms of flammability or anything scientific. But I'm thinking about trying some flame-polishing on an MX brown stem to see if I can smooth it out. I have some spares to play with, and I'm planning on opening my switches up to lube them anyway. Has anyone ever tried anything like this before? Re: The MX Scratchiness Problem - Kill It with Fire? I wouldn't purposely be melting POM unless you're in a really well ventilated area as it releases formaldehyde gases. Your flame would also have to be positioned properly, or you could end up melting other parts of the stem. How would you plan on protecting the rear parts? I think if I come at them from the top-front (upper right in your pic), I can hit the main upper body and tactile arms of the stem, which seem to be the worst offenders of scratchiness. I could easily do this by arranging a row of stems on their backs as you have them pictured, but with the cruciforms pointed at me. Then I come in at a 45-degree angle, side to side across the row of stems with the torch. This should avoid unnecessarily messing with other parts of the stem. #1 worst offender in scratchy feeling is definitely the "legs". However getting the side sliders (including the inside 90 degree part) is also another factor. Any plans on those two surfaces? I'd imagine the slightest bit of melting would cause the slider to not freely move up and down. Since the surface will be the first thing to melt, I'm hoping I can find that sweet spot where the surface melts and re-forms without causing any major deformities. I am definitely going to start with a single stem, though, just to be sure (I have extras). It's worth a try. The melting points are similar enough (175 degrees C for POM, 160 for Acrylic). Just be sure to do as Zeal says and try it in a well-ventilated space. I am impressed by your willingness to attempt such an unusual and tricky procedure. My expertise mostly comes from trial and error, if you can get consistent results here you will surely be "da man" with "da torch"
Thanks for the encourgement, everyone. I honestly have no idea what to expect but I'm pretty optimistic. Fire and I go way back. Alright, here are my preliminary findings. Basically, the goal of flame-polishing is to liquefy the plastic, so that surface tension will cause the molten plastic to "self-level," eliminating the bumps left there by the well-used Cherry molds. First thing I noticed when I popped open one of my spare MX browns, is how tiny the stems are. The tactile "legs" are only about 1mm thick. I knew it wouldn't take much to mess them up. From left to right: stock, flame-polished, and overcooked. On the middle stem, you can notice a slight rounding of the corners of the legs compared to the stock stem. You can see that the legs have been completely deformed on the right stem. I flame-polished three stems. Two came out good and one was overcooked. I figured two was enough for some testing. While I was in switch-opening mode, I went ahead and lubed a stock switch with thick Krytox from TechKeys. I lubed both the legs and the side sliders. I marked the leads with different colors so I could tell them apart during my testing. The leftmost switch is unmarked, and the stem is stock. The black switch has been lubed. The two blue switches have been flame-polished. 1 Lubed Flamed Stock Flamed Guessed right on every one. Initially thought #2 was stock until I felt #3. 2 ? ? ? ? Inconclusive. I was really confused for some reason during this round. Sophomore jinx? 3 Flamed Lubed Flamed Stock Guessed right on every one. 4 Flamed Flamed Stock Lubed Was unsure about my initial guesses, so I took a second pass before looking and guessed every one right on the second pass. 5 Flamed Flamed Lubed Stock Confused flamed with both lubed and stock on the first pass before settling on the correct guesses on a second pass. 6 Flamed Flamed Lubed Stock Guessed right on the first pass. 7 Stock Flamed Lubed Flamed Guessed all on first pass except #1 (I thought it was flamed at first until I felt #3 and #4). 8 Flamed Stock Lubed Flamed Guessed all on first pass except #2 (I thought it was lubed at first until I felt #3). 9 Flamed Stock Flamed Lubed Mixed up stock and lubed on this round. 10 Flamed Flamed Stock Lubed Mixed up flamed (#2) and stock on this round. The differences between all three types are pretty subtle, at least when tested as bare switches rather than in an actual keyboard. Despite the relative subtlety, it was pretty easy to guess which switch I was using most of the time. This proves that there is indeed a difference. Lubed switches are much smoother than stock, but have much less tactility. 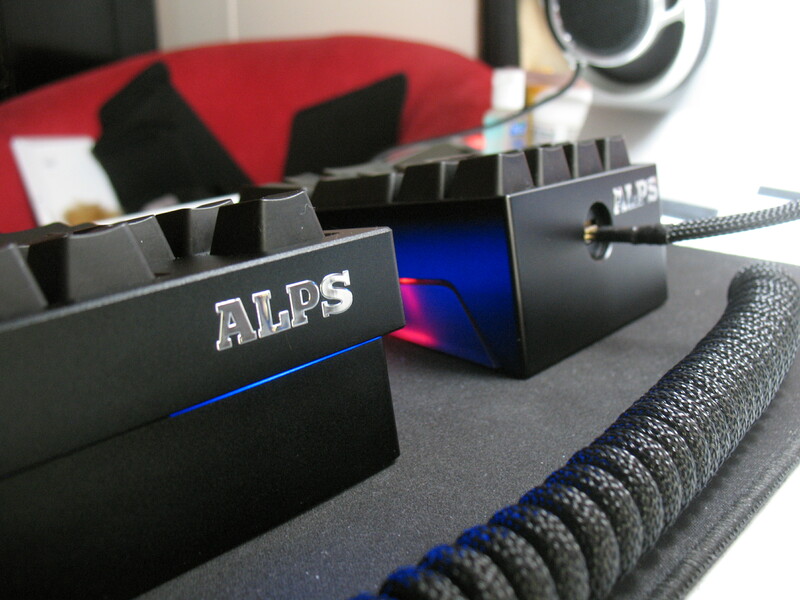 Flame-polished switches are somewhat smoother than stock, and have a much more pronounced tactility. They almost feel like ergo clears. Interestingly, lubed and flame-polished switches are easier to tell apart than either type compared to stock, because they are both on opposite ends of the tactility spectrum. When I became confused during testing, it was usually due to the relative tactility rather than the smoothness. Flame polishing works, but it's more risky than lube because it's easy to destroy a stem. The overcooked stem pictured above is basically useless now. It feels weird and the stem gets stuck on its way back up. I believe I could master the art and nail down the precise timing to be able to produce a whole batch of correctly flame-polished switches, but there would probably be more than a few casualties along the way. I'm wondering if the higher heat of a torch might do better than the lighter, since it can superheat the surface very quickly without allowing time for that heat to conduct its way deeper into the plastic and cause deformities to occur. If I ever end up getting one of those butane mini-torches, I might give that a try. But right now I don't have very many spare browns, so I'm not going to try and make any more with the lighter. I've got some Gateron Browns coming as part of a Planck kit from Massdrop. I'm going to bag up these switches I used for testing, and when the Gaterons get here I might do another round of testing with one or two of those. So I would say the jury's still out on flame-polishing. But it is definitely a worthwhile idea to explore if you have some browns to spare. And if you have a torch, I'd be really interested to hear how that goes. This has to be one of the craziest mod I've seen here, but it makes a lot of sense and very informative. Soon cherry switches will have to be: flamed, lubed, stickered to be usable. Or made by Gateron, apparently. Interesting results though. Definitely hard to get each stem "polished" right if doing this mod. If you have a macro lens, I'd be interested in seeing some comparison pics. Unfortunately not. I may be able to borrow one, though. I'll look into it. Now you just need to get all you Ohio folks together and do a triangle test and test for statistical significance! I wonder if acetone vapor would smooth out POM? I know a lot of people use acetone vapor to smooth their PLA and ABS 3d prints. It might be worth a try. Very cool little experiment. Great read! I couldn't remember offhand about POM & acetone, so I just tried it. I put my overcooked MX brown stem into a puddle of acetone (of course I have a can of acetone, doesn't everyone? ), and it didn't even notice. The acetone evaporated and the stem is unfazed. Pretty much what I've read is that most attempts to polish POM are not very effective. The most consistent answer I'm getting for smoothing POM/Delrin is through shaving the surface, which is what a certain GH member does to smooth out his ergo clear switches. I believe they started the trampoline mod thread as well, but I can't remember their name. EDIT: Oh, there they are -- Oobly. Scrolling down, one user mentions that they did have luck flame-polishing! If you can get consistent results, go for it! I'm not sure what would be best here. Trying to shave the legs might be very difficult but probably would be more forgiving than flame polishing, though perhaps ruin some tactility. Hmm. I had pretty good luck flame polishing Delrin. The parts were about 3/8ths in diameter and I had a fixture to hold a bunch. I used a propane torch hanging over the mill table. I programmed it to feed past the parts. I did it fast at first to see how it worked and then kept slowing it down until I got the finish I wanted. Glossy! You really can't do it by hand. That guy's idea of using a CNC table to auto feed the parts is pretty clever. I no longer have access to CNC machines, but it's got me thinking about other ways to regulate the feed rate. And again, I suspect the higher temperature of a torch might yield even better results. Might be impractical for switch stems (I guess you can wear heavy duty leather gloves), but how about buffing the legs with a jewelry buffer wheel? It could heat up the plastic enough to smooth it out a bit while polishing the legs. My worry with this idea and the scraping method, is that they're actually removing material which might affect the switch's mechanical function, and almost definitely affect the tactile feel. Seems to me that flame-polishing is just "regrading" the surface without changing the overall profile. I mentioned earlier that I suspect a hotter flame might do a better job than a plain old lighter. So I bought a butane micro-torch from Amazon and I just received it late yesterday. After trying it out on a couple stems, I definitely think this is a better way to go than a lighter. The hotter flame seems to do a better job heating the surface only, before the whole leg has a chance to melt and deform. Unfortunately I don't have time to take pics and write up this second round. But it proves the idea well enough that I'm going to try it on the browns in my Infinity. I was going to open them up for lube and stickers anyway, so I'll go ahead and flame polish them at the same time. When I do that, I'll be sure to take lots of pics (and maybe even some video) to show exactly how I do it. Basically, the trick is to pass the flame back and forth across the surface, until you see the legs get shiny, then immediately remove the heat and let cool. This requires a good eye and lots of light. You should try heating and quenching one. Just for giggles. Honestly, it's so little heat on such a tiny part that it would cool before I got it into the bath. Flame polished and tempered POM, baby. 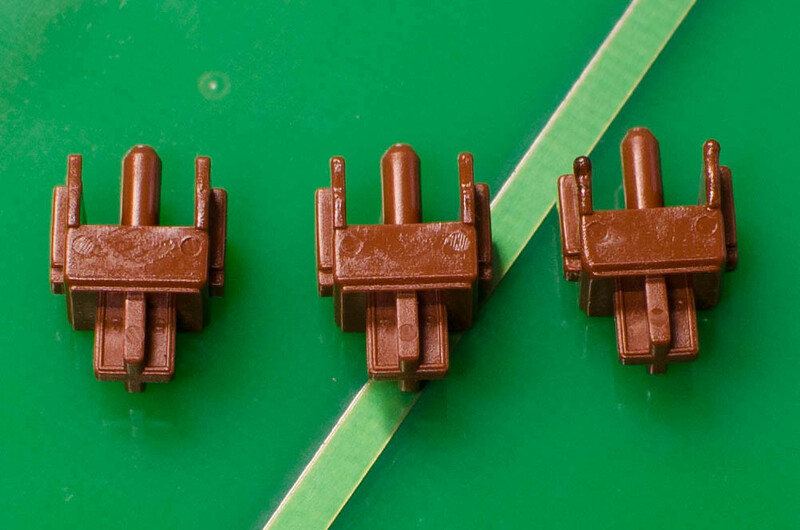 When I shave my switches I don't shave the contact are of the legs, just the mould seams. It helps, especially the ones between the legs and main slider part, but they still need wearing in and it's slow. Browns are also not quite tactile enough for my taste. Will still trampoline and latex mod them, though. I really dig the idea here. The CNC setup would probably work great, or at least something with a power feed to give consistent results. Definitely, I could see somebody reselling switches at a markup if they can get consistent results. If I were dead set on using MX as opposed to Zealio then I would want the smoothest experience possible. Off topic, were you also addicted to fire as a kid? Once, when I was 12 years old, I lit a large box full of styrofoam packing peanuts on fire on the front sidewalk, billowing black smoke into the air. 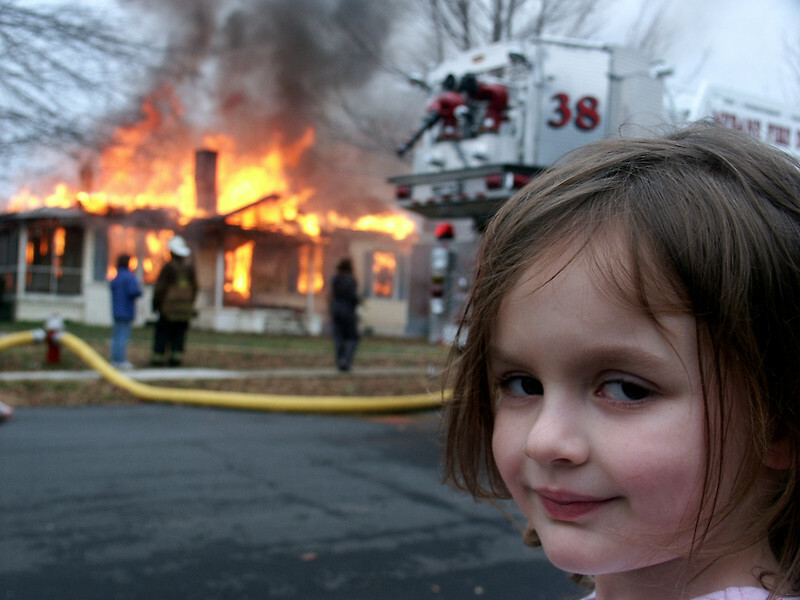 The neighbors called the police, and when the officer showed up he told me I had to put out the fire. I asked him why I should have to listen to him since it's my box and my sidewalk. The officer explained that it is, in fact, the city's sidewalk, and restated his directive that I put the fire out immediately. I did so, and when the flames had subsided the officer said, "now I want you to clean up all this mess right away," to which I responded, "why should I clean it up? It's not my sidewalk!" The exceedingly patient officer replied, "do you want me to take you down to the station and explain it to you?" That's when I cleaned up the mess. EDIT: Good thing you aren't trying to polish the housing with solvent. Nylon seemingly has no good common solvents! MEK Might be the easiest to acquire, but last I checked, it's some seriously toxic stuff. Definitely not for the bedroom tinkerer such as myself (I have no workspace, lol). Oobly, what exactly is the latex mod? Are you using latex sheet as a landing pad or on the slider to dampen the upstroke, or are you using rubber cement in some fashion? I am certainly NOT an expert on Cherry anything, but I really got to thinking. What if you used a polishing wheel on the stems instead? Would that work? Like a Dremel Fiber Cleaning and Polishing Wheel? Part 414. It's a thought I had. Unfortunately, I guess that it would probably eat the switch rather than polish it. That pad is used mainly for polishing metal and other more solid objects. I guess I was thinking more about how some places use some compound and a polishing wheel for CD's and the like. Could that be applied in this particular application? It dries to a slightly yellow, clear soft rubber, but it takes some time to dry. It's water-based and usually has some ammonia in, so it stinks when it's still wet, but the smell fades when it's dry. It dampens the upstroke enough to be a little quieter and when used with a solid board design (metal plate) it sounds a lot better than the more plasticky click of unmodded switches. The ones I originally did in 2013 are still working fine, so it seems to be durable enough, too. Sounds like a fantastic mod, Oobly. That's the function I thought the mod would serve too. That plus trampoline means a fully dampened switch--pretty cool! Definitely reminds me of the Matias Quiet series. Is it actually latex? Two years seems good but I'm thinking about old rubber bands...I'm wondering if a similar product exists made with silicone. Wouldn't RTV gasket sealant do the job here? That's silicone. I've got a bunch of that stuff. I might have to try that mod. Alternatively, you could maybe try to find 1/64th or 1/32nd inch thick silicone sheet that has an adhesive backing, but that might be a little difficult to work with and find. Might not hold up over time either. I think using something that sticks and solidifies like a glue is probably the best bet. Seems so, from the ammonia smell. The timeline seems OK too - rubber bands have all sorts of fillers that increase wear and porosity, so they die more easily. Still not a good choice, as it will degrade in air over a few years, and is a mess to clean up. AFAIR when it comes into contact with mineral oil, it will become gooey and sticky, impossible to get off. Silicone oil preserves it nicely though. If you want a similar product with silicones, get one of the caulking condensation-based silicones, preferably not acetate-based (its acidic, will eat into metal parts), and dissolve it. Turps or toluene work OK as a solvent, acetone doesn't. You may try adding some silicone oil to the mix to make it softer when cured, though beware, too much and it wont cure, or will get goopy and easy to tear. RTV silicone with a fast-evaporating solvent such as Toluene could work. It will give a very thin layer, though it won't stick to anything. There are primers that should make it stick, but no experience with these. Polyurethanes have best dampening properties, and they stick to most stuff. Not as good as silicones when it comes to resistance to atmosphere and UV, but still much better than latex. https://en.wikipedia.org/wiki/Sorbothane <- king of the hill when it comes to dampening stuff. Low-shore platinum-cured silicones come close second. Good luck having them cure, though. I'm familiar with Sorbothane because it's being used in the Smallfry keyboard kit as a dampening gasket between the top and bottom plates. I'm eager to get mine so I can see it first hand. I think in this case, dampening is less critical than impact absorption... Ar least I don't think those are the same thing. I'm glad someone with so much know how chimed in, haha. Yeah, I was eyeing sorbothane for some custom builds myself! I'm not sure if it's a case of diminishing returns though when it comes to dampening typing noise or shock. Yup, it really is latex and is still working just fine. I guess it will eventually degrade, but as long as it doesn't go completely gooey it'll still be doing its job. I suppose RTV gasket sealant could work if you apply it very carefully with something, but it'll be hard to make a consistent thickness, although it's not critical in this application. You don't want it too thick, though, as it will then start to affect the switch travel and feel. It just has to adhere a little better to the case top than the slider and it should do that if it cures in place on the top. From my experience it will be very difficult to apply without diluting, though. It tends to rather stick to whatever you're applying it with rather than to. I used latex simply because it was what I had to hand, was easy to apply and I was experimenting. I'd love to find something that I know will last longer for peace of mind, though. At least in my application, the atmosphere is fairly dry and consistent temperature and it should continue to hold up for a while. Perhaps one of the moldmaking silicone rubbers that the guys are making artesan caps with could do the job well and last longer. In fact, I think almost any of the lower viscosity, low shore hardness silicone rubbers will do the job well. Quantum Silicones makes a massive range of these and I'll try to get one or two to try out. I would guess the lower shrinkage, addition-cured ones would adhere a little better to the case top. I'll report in the trampoline mod thread when I get around to it. Page created in 0.121 seconds with 64 queries.